When induced drag and parasite drag are plotted on a graph, the total drag on the aircraft appears in the form of a “drag curve.” Graph A of Figure 4-9 shows a curve based on thrust versus drag, which is primarily used for jet aircraft. Graph B of Figure 4-9 is based on power versus drag, and it is used for propeller-driven aircraft. This category focuses on power versus drag charts for propeller-driven aircraft. Understanding the drag curve can provide valuable insight into the various performance parameters and limitations of the aircraft. 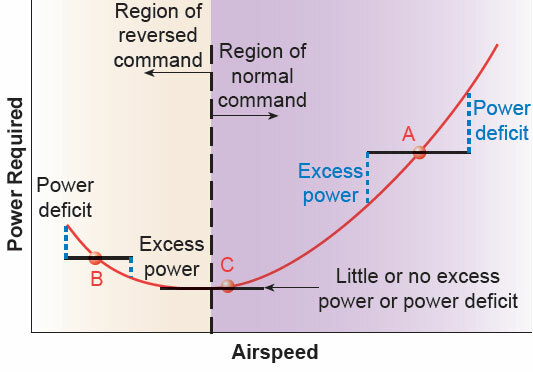 Because power must equal drag to maintain a steady airspeed, the curve can be either a drag curve or a power required curve. The power required curve represents the amount of power needed to overcome drag in order to maintain a steady speed in level flight. The propellers used on most reciprocating engines achieve peak propeller efficiencies in the range of 80 to 88 percent. As airspeed increases, the propeller efficiency increases until it reaches its maximum. Any airspeed above this maximum point causes a reduction in propeller efficiency. An engine that produces 160 horsepower will have only about 80 percent of that power converted into available horsepower, approximately 128 horsepower. The remainder is lost energy. This is the reason the thrust and power available curves change with speed. The drag curve also illustrates the two regions of command: the region of normal command, and the region of reversed command. The term “region of command” refers to the relationship between speed and the power required to maintain or change that speed. “Command” refers to the input the pilot must give in terms of power or thrust to maintain a new speed once reached. The “region of normal command” occurs where power must be added to increase speed. This region exists at speeds higher than the minimum drag point primarily as a result of parasite drag. The “region of reversed command” occurs where additional power is needed to maintain a slower airspeed. This region exists at speeds slower than the minimum drag point (L/DMAX on the thrust required curve, Figure 4-9) and is primarily due to induced drag. Figure 4-10 shows how one power setting can yield two speeds, points 1 and 2. This is because at point 1 there is high induced drag and low parasite drag, while at point 2 there is high parasite drag and low induced drag. Figure 4-10. Regions of command. Most flying is conducted in the region of normal command: for example, cruise, climb, and maneuvers. The region of reversed command may be encountered in the slow-speed phases of flight during takeoff and landing; however, for most general aviation aircraft, this region is very small and is below normal approach speeds. Flight in the region of normal command is characterized by a relatively strong tendency of the aircraft to maintain the trim speed. Flight in the region of reversed command is characterized by a relatively weak tendency of the aircraft to maintain the trim speed. In fact, it is likely the aircraft exhibits no inherent tendency to maintain the trim speed in this area. For this reason, the pilot must give particular attention to precise control of airspeed when operating in the slow-speed phases of the region of reversed command. Operation in the region of reversed command does not imply that great control difficulty and dangerous conditions exist. However, it does amplify errors of basic flying technique— making proper flying technique and precise control of the aircraft very important. 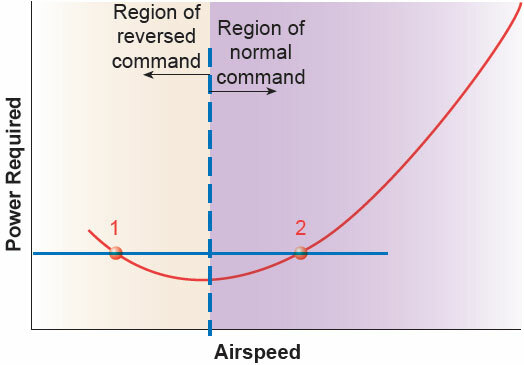 The characteristics of flight in the region of normal command are illustrated at point A on the curve in Figure 4-11. If the aircraft is established in steady, level flight at point A, lift is equal to weight, and the power available is set equal to the power required. If the airspeed is increased with no changes to the power setting, a power deficiency exists. The aircraft has a natural tendency to return to the initial speed to balance power and drag. If the airspeed is reduced with no changes to the power setting, an excess of power exists. The aircraft has a natural tendency to speed up to regain the balance between power and drag. Keeping the aircraft in proper trim enhances this natural tendency. The static longitudinal stability of the aircraft tends to return the aircraft to the original trimmed condition. Figure 4-11. Region of speed stability. An aircraft flying in steady, level flight at point C is in equilibrium. [Figure 4-11] If the speed were increased or decreased slightly, the aircraft would tend to remain at that speed. This is because the curve is relatively flat and a slight change in speed does not produce any significant excess or deficiency in power. It has the characteristic of neutral stability (i.e., the aircraft’s tendency is to remain at the new speed). The characteristics of flight in the region of reversed command are illustrated at point B on the curve in Figure 4-10. If the aircraft is established in steady, level flight at point B, lift is equal to weight, and the power available is set equal to the power required. When the airspeed is increased greater than point B, an excess of power exists. This causes the aircraft to accelerate to an even higher speed. When the aircraft is slowed to some airspeed lower than point B, a deficiency of power exists. The natural tendency of the aircraft is to continue to slow to an even lower airspeed. This tendency toward instability happens because the variation of excess power to either side of point B magnifies the original change in speed. Although the static longitudinal stability of the aircraft tries to maintain the original trimmed condition, this instability is more of an influence because of the increased induced drag due to the higher AOA in slowspeed flight.